The story is set in a town called Endora, with a population of around a 1000 people, where everybody knows everybody else. Gilbert is a grocery shop clerk/ delivery boy in a small, traditional grocery store. The store is threatened by the opening of a branch of a supermarket chain. Gilbert lives with his family, where the father had committed suicide around seventeen years ago, after which Mama went into depression and turned extremely obese. She does not move out of the house and spends almost all of her time on the couch watching TV and eating. Arnie, Gilbert’s mentally challenged younger brother, is difficult to handle and needs constant attention. For example, Arnie enjoys climbing to the top of the local water tower and does not know how to get down, creating tension and drama for the whole town. Gilbert also has two sisters who bicker most of the time. The responsibility of taking care of the family falls on Gilbert (in his early twenties). This responsibility includes taking care of the mother, keeping a watch on his unstable brother and taking up ‘home improvement’ projects for the upkeep of their very old and crumbling house. Gilbert: Why will I take care of it? Gilbert fulfills his responsibilities most of the time, while he also does ‘normal’ things, like hanging around with other young men of his age. He has a clandestine lover – a married woman and a customer of his grocery store (to her, he is more than a delivery boy). At times, Gilbert broods, gets frustrated, gets bored and wants to get out of the rut. And at times, his brother and his mother annoy him, and make him lose control. In this unchanging scenario, a young girl along with her grandmother reach Endora as they are passing through in their RV along with other annual tourists. The girl Becky, a free spirit, kindles Gilbert’s romantic interest, and brings hope and enthusiasm to him. She also bonds well with Arnie. Along the way, there are many interesting incidents that impact the family – like Arnie getting arrested, Mama forcing herself to get out of the house, Gilbert getting angry with Arnie and then repenting, Gilbert’s lover moving away, etc. Through all this, Gilbert is a gentle outsider, soulful and a pillar of strength to his family – though he has his ‘off’ days. A remarkable film that once viewed, will leave an indelible impression and haunting images. Images of the small town of Endora, the towns-peoples’ concerns, of the Grape family, the obese Mama, the unpredictable Arnie, the energetic Becky, and of course the steadfast Gilbert. Johnny Depp delivers a magnificently understated performance as Gilbert Grape. Gilbert is not a hero, but someone trying to make the best of a difficult situation. Sometimes he is stoic, sometimes frustrated, and usually loving and caring. Leonardo Di Caprio as a mentally challenged Arnie should have got the Oscar that he was nominated for – this is one of his most electrifying performances till now. DiCaprio makes Arnie’s tics so startling and real that he is sometimes difficult to watch. Maybe the Oscars’ committee thought that the movie actually used a retarded kid to play Arnie (I cannot see any other reason why he did not get the award). Both Depp and Di Caprio are big stars now. 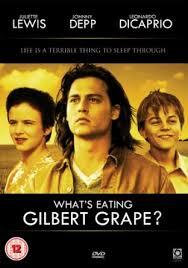 What’s Eating Gilbert Grape? was one of their first movies (before The Titanic, before Pirates of …. ), and in my opinion is one of their best works till now. Definitely worth watching and savoring. The movie is around 2 hours and can be watched in 2-3 stretches. I have seen this one, Rajesh. Good one . I remember the title fascinated me when I borrowed this title from a library to view. I did not know that it was Leonardo who played the role of the mentally challenged. There are some movies played by Tom Hanks that are also of a different genre and make for enjoyable viewing.